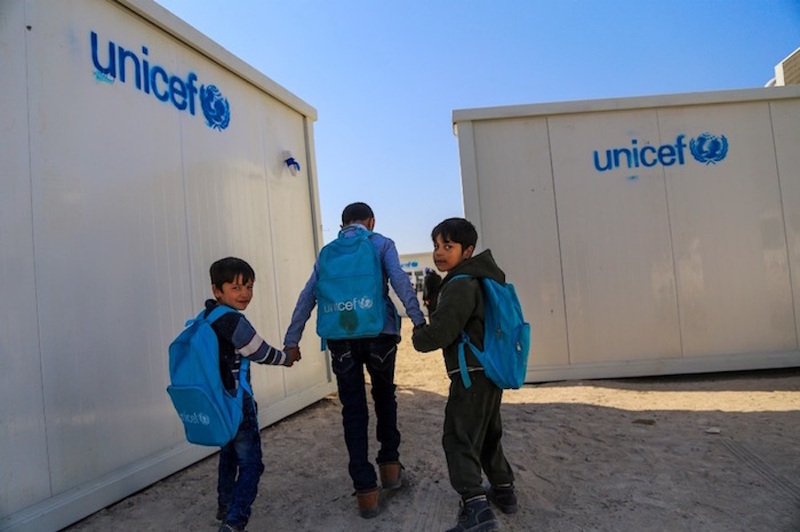 UNICEF Iraq’s Chief of Communications Sharon Behn Nogueira recently visited Fallujah, Iraq, where UNICEF is rehabilitating schools, including the five featured in this story. FALLUJAH, Iraq — The walls of Fallujah are scarred with bullet holes. Six months ago, 85,000 people fled the city as bombs fell on their houses in the fight to retake the city from the so-called Islamic State, locally known as Da’esh. Many others had escaped earlier. Today, young students are kicking through the debris of that battle to get to school. Many houses and schools are damaged. In one school, hit by several mortars, crushed blue chalk and glass carpet the entryway. But people are coming back; small shops are opening, cement chunks are being cleared away, mortar holes filled, and in the schools, fresh chalk has arrived. It’s winter in Fallujah and there is no heat in the classrooms. In one school, the children are wearing hats, gloves and coats as they sit at their wooden desks and follow the lessons on the blackboard. 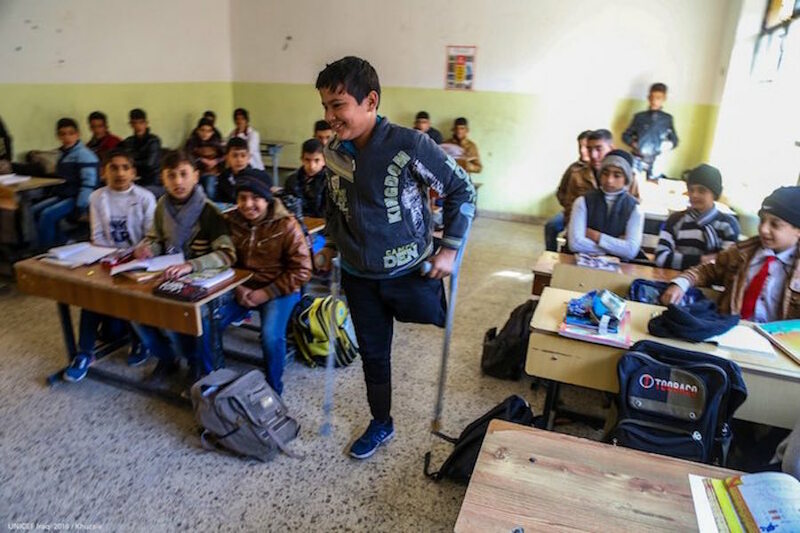 It’s a modest start, but for children like Hamed, 13, who lost his father and his own leg in a mortar attack in August 2015, it’s the beginning of a return to normality after years of conflict. As he talks about his wish to be an art teacher, an explosion goes off nearby — teams of de-miners are still clearing the city of the bombs left behind. 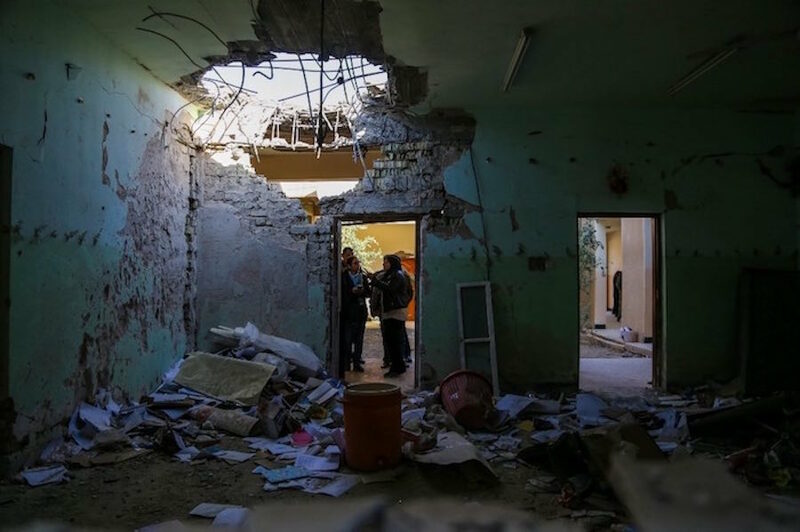 During a visit to five schools in the city, there were four controlled detonations, a reminder of the conflict that these girls and boys and their families ran away from. But now they are returning from cities around Iraq and the Kurdistan region where they took refuge. “Half of my friends and half of my neighbors have come back,” said Mohamed, 8, who wears a brown coat with the hood over his head. The classrooms are packed with children, even though they are still waiting for textbooks, and there is nothing on the walls, no colored pencils and few notebooks. Nearby, another school has been rebuilt with just $4,000, allowing 500 children to return to class. The teacher, Sahera Abass, says new families are arriving every week. She left the city in January 2014 when the so-called Islamic State swept in, and returned a month ago. “I came back because this is my school, this is my job, this is my home. I wanted to come,” she says. One of the city’s bigger secondary schools had been hit with a large bomb, flattening part of it. Luckily, it was empty at the time. Today, it is full of teenage girls in uniforms, including Noor. She fled Fallujah with her family and lived in three different cities in the past two years before returning home. Consider helping UNICEF rebuild even more schools in Fallujah and help more Iraqi child survivors of violence and conflict.